Our laboratory studies the interplay between bacterial pathogens and their host cells. 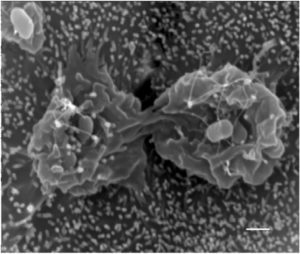 Specifically, we are examining how the obligate intracellular pathogen Salmonella manipulates host cell cytoskeletal and membrane trafficking machinery to drive its uptake into non-phagocytic epithelial cells, and its survival inside both epithelia and macrophages. We use a combination of genetic, biochemical and morphological approaches (confocal, live cell microscopy, EM) in vitro, and mouse models to define the roles of specific host molecules in pathogenesis in vivo. We are also characterizing a novel pattern recognition receptor, BAI1, which mediates the clearance of Gram-negative bacteria by macrophages. We had previously shown that BAI1 recognizes the surface lipopolysaccharide (LPS) expressed by all Gram-negative species, and actively drives bacterial phagocytosis in macrophages. More recently we found that BAI1 not only mediates bacterial internalization, but is also required for the production of reactive oxygen species that ultimately kill internalized bacteria. We are currently working to define the signaling pathways that operate downstream of BAI1 and to define its role in bacterial clearance in vivo. We study the role of lipid dynamics in regulating membrane composition and trafficking in the secretory and endocytic pathways. Our primary focus is on the cellular mechanisms that distribute cholesterol to support the storage and secretion of insulin by endocrine pancreatic beta cells. Cholesterol is concentrated in the membranes that surround packaged insulin, and its levels are maintained within narrow limits to insure both stable intracellular storage and optimal glucose-stimulated secretion. Moreover, beta cells control the amount of stored insulin by coordinating the rates of proinsulin biosynthesis, insulin release and granule turnover by degradation. We are interested whether granule cholesterol level is a key determinant in maintaining cellular insulin homeostasis. To explore these issues, we use a variety of molecular, biochemical, and microscopic imaging approaches to analyze how manipulation of cholesterol regulatory machinery affects insulin granule formation, storage, release and turnover. We examine these events in insulin-producing cell lines and primary cultures of pancreatic islet cells. 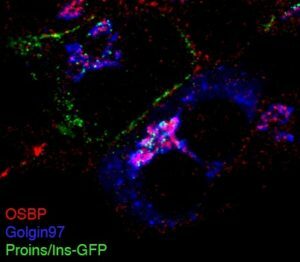 Image: Cholesterol regulatory protein OSBP concentrated at sites of insulin granule formation. Research interests field: Intracellular cholesterol and the regulation of insulin secretion and membrane trafficking. The DeSimone lab seeks to uncover mechanisms responsible for the coordination of single cell behaviors, the emergence of collective cell movements, and the sculpting of tissues – hallmark features of morphogenesis. Nowhere is the importance of these linked processes better illustrated than at the onset of vertebrate gastrulation when progressively differentiated communities of cells initiate a dramatic series of rearrangements that culminate in the segregation of germ layers and establishment of the vertebrate body plan. As these events unfold, the cells and tissues involved generate mechanical forces that are borne by both cell-cell (e.g., cadherin) and cell-ECM (e.g., integrin) adhesions. The spatial juxtaposition of simultaneous morphogenetic processes in the embryo ensures that any one tissue is subject to forces generated locally and at a distance. We are attempting to link this ebb and flow of mechanical signals to the emergence of specific behaviors of cells or groups of cells in vivo. Progress in this area promises to reveal fundamental principles of normal development operating at multiple levels of organization. The Dwyer Lab works to elucidate the cellular mechanisms of brain development, and the disruptions that cause neurodevelopmental disorders. Using the mouse model, we study single gene mutations that alter brain size or structure, or the connections between neurons. In particular, we study how neural stem cells divide to produce either more stem cells or neuronal daughter cells. We investigate the roles of cytoskeletal proteins in regulating cell shape changes during cell division, polarization, and neuron morphogenesis. Our discoveries elucidate fundamental cellular mechanisms important not only in the nervous system, but in development of many tissues and disease processes. The Halme Lab is studying tissue regeneration. In particular, we have been interested in addressing the following questions: How and why does development constrain the regeneration of certain tissues? How is tissue regeneration coordinated with developmental growth and differentiation? What is the relationship between neoplastic tumorigenesis and tissue regeneration? How is tissue function altered during regeneration? We have been using the experimental model of Drosophila melanogaster to examine how tissue regeneration and tumorigenesis are regulated at multiple levels – individual cells, whole tissues, and via systemic endocrine signaling that affects the entire organism. This ongoing work has already generated new insights into how tissues regenerate, the signals that drive tumor formation and neoplastic transformation, and has led us to examine other human diseases such as asthma and inflammatory bowel disease, where we think that dysregulated regenerative activity contributes to disease pathology. 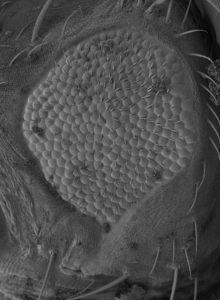 Our research focuses on the morphogenic events that allow the Wolffian (epididymal) duct to elongate and coil. Without proper development, male infertility will result. The duct elongates primarily via cell proliferation and cell rearrangements, e.g. convergent extension, of which Protein Tyrosine Kinase 7 (PTK7) plays a major role. Our data supports the hypothesis that PTK7 activates myosin II, which in turn generates cell protrusions and subsequent cell intercalation. This maintains proper ductal length, thickness of the epithelium, cell size and shape. PTK7 does not regulate cell proliferation. During postnatal development we discovered that Phosphatase and Tensin Homologue (PTEN) regulates cell differentiation. PTEN is of special interest because it is a tumor suppressor in many tissues, and its expression in the epididymis maybe a reason why the epididymis rarely succumbs to cancer. However, we discovered that PTEN is not a tumor suppressor in the epididymis. No one has attempted to address the biological basis of dry eye, the most common eye disease. The Laurie lab did so and discovered ‘lacritin’, a novel multifunctional glycoprotein required for tearing, and independently for epithelial homeostasis. An expanding toolbox of ~70 truncation and point mutants of lacritin, its coreceptor syndecan-1, and of signaling mediators such as ATG101 – some single or even double tagged – drives our progressive exploration of the unique ways by which lacritin regulates epithelial metabolic function. 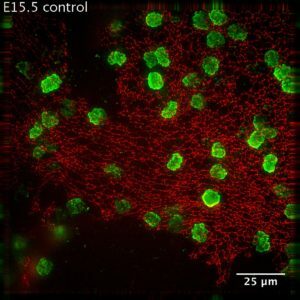 We use confocal live cell imaging of mitochondrial fission and fusion, monitor cellular oxygen consumption rates in real time, and measure subtle metabolomic changes. Multi-institutional ‘Lacritin Consortium’ meetings held three times yearly include clinicians whose collaborative samples suggest that dry eye may be a disease in large part of lacritin ‘monomer’ deficiency. A lacritin synthetic peptide is now being developed as a topical dry eye treatment. 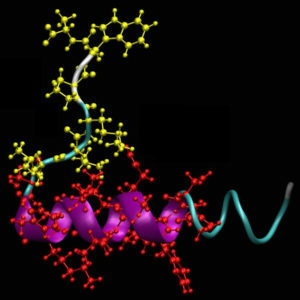 Image: GROMACS model by collaborator Michael Shirts of lacritin’s C-terminal domain. Our lab is interested in how intercellular interactions in epithelial tissues establish and maintain their proper form and function. One specific focus is on the role of planar cell polarity (PCP) signaling in coordinating cell-cell adhesion and cytoskeletal dynamics. PCP signaling drives polarized cell behaviors in both epithelial and non-epithelial tissues, and disruption of PCP signaling is frequently linked to birth defects and cancer. Therefore, dissecting the underlying mechanisms will shed light on disease etiology. We have several ongoing efforts to study PCP signaling in different types of epithelia, such as the sensory epithelium of inner ear that is essential for hearing, and the neuroepithelium of the developing brain where neural stem cells reside. We aim to understand how PCP signaling controls disparage processes ranging from cytoskeletal asymmetry to oriented cell divisions. 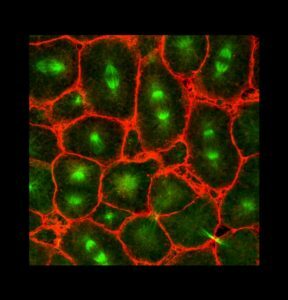 We use multiple approaches to study these processes, including transgenic mouse models, organotypic and cell cultures, fluorescence live imaging and protein biochemistry. My lab studies how cytoplasmic dynein, a microtubule-based motor is regulated to deliver various membrane bounded organelle cargos to the proper locations. Our current focus is on identifying the mechanism(s) involved in dynein binding to specific organelles, using dynein binding to signaling endosomes that form in response to the addition of neurotrophin to cultured neurons. We found that neurotrophin stimulates phosphorylation of a specific amino acid on the dynein intermediate chain (IC) by ERK kinase (extracellular-signal-regulated kinase, a downstream effector the neurotrophin receptor kinase). Live cell imaging with fluorescent protein-tagged wild type and phospho-mimic mutant ICs expressed in neurons, coupled with biochemical studies on purified endosomes support the hypothesis that phosphorylation increases dynein binding to endosomes, but not binding to a second organelle, mitochondria. Importantly, this phosphorylation does not affect dynein binding to dynactin, a known linker of dynein to many cargos. Our data thus suggests that dynein binding to signaling endosome requires a component in addition to dynactin. 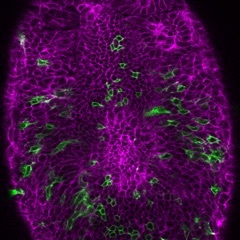 The research in the Sutherland lab focuses on the cell behaviors driving morphogenesis in the early mouse embryo. Using long-term (6-8 hours) time-lapse confocal imaging of transgenic animals expressing fluorescent reporter proteins (EGFP and Tomato fluorescent protein), we have obtained high-resolution imaging of individual cell behavior in the mouse embryo. This has enabled us to describe the cellular mechanisms underlying elongation of the primary axis of the embryo, and to extend this analysis to embryos lacking proteins of the planar cell polarity (PCP) signaling system, which exhibit both a shortened primary axis and neural tube closure defects. We also discovered a novel function of the mTOR signaling pathway in regulating blastocyst activation for implantation, which is regulated by availability of specific amino acids. In addition, we have described specific effects of uterine extracellular matrix on trophoblast cell behavior and development of the placenta. View the labs webpage here. How do you build a vertebrate embryo from naive pluripotent embryonic cells? 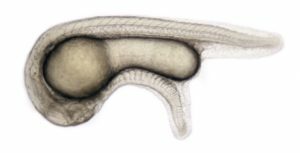 We recently discovered that a complete embryonic axis, containing all tissues and organs of a normal embryo can be organized by instructing uncommitted pluripotent zebrafish embryonic cells with as little as two opposing gradients of morphogens, BMP and Nodal. Because the signaling pathways controlling early embryonic development have been conserved across evolution we predict that these finding can be extrapolated to the organization of early mammalian embryos. Therefore we are now trying to take control of aggregates of mouse embryonic stem cells (embryoid bodies), instructing them through experimentally engineered, spatially defined, morphogen gradients that should control fate and behavior of these pluripotent cells. Our ultimate goal is to use this approach to generate in vitro functional tissues and organs for future application in Regenerative Medicine. During the past two decades, our lab has dissected the network of molecular activities controlling the early embryonic development, focusing on the establishment and regulation of the formation of the dorso-ventral and antero-posterior axes. We are now studying how Left-Right asymmetry of the embryo is setup and controlled. 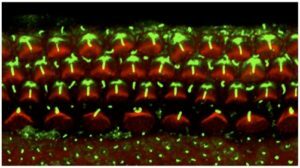 We recently discovered an unsuspected role for factors mediating or regulating the transcriptional response of the Hippo signaling in the formation of the ciliated organ responsible for the Left-Right asymmetry: the Left-Right organizer. Using Crispr/Cas9 editing technology as well as a variety of gain of function and gene knockdown methods, we are currently dissecting the molecular mechanisms regulating the formation of this organ and through a comprehensive analysis of the transcriptome of its precursor cells, we will characterize the cascade of gene products involved in its formation and function. One project in our Lab focuses on molecular events required for Ebolavirus entry into cells. A peculiarity of Ebola is that it must traffic deep in the endocytic pathway—passed early and traditional late endosomes—to endolysosomes where the viral and endolysosomal membranes fuse thereby providing the infectious genome with cytoplasmic machinery needed to make more virions. One reason Ebola traffics to endolysosomes is for its glycoprotein to bind to its intracellular receptor, the Niemann-Pick C1 (NPC1) protein. 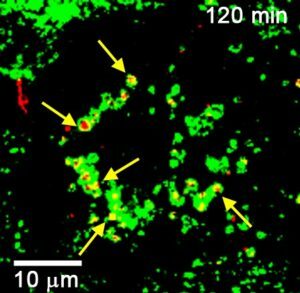 After that other, still poorly characterized events, elicit the fusion activity of the Ebola glycoprotein The accompanying image shows Ebola viral-like particles, which contain an mCherry-tagged matrix protein (red), after 2 hours of interaction with monkey kidney cells. 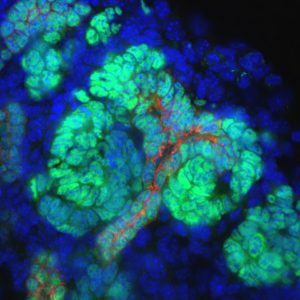 At this time the cells were fixed and stained with an antibody to NPC1 (green). Areas of colocalization appear yellow (several indicated with yellow arrows). This work is helping to elucidate the mechanism of a key step in the infectious cycle of this devastating viral pathogen. Visit the White lab here. Neurons are among the largest cells in the body and also among the longest lived. 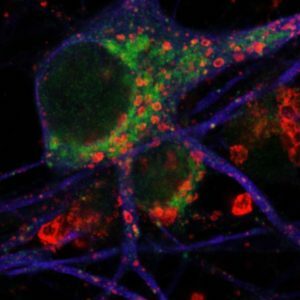 The size and longevity of neurons creates unique challenges for molecular and cellular machinery that regulate the cytoskeleton and membrane traffic. The Winckler lab studies the molecular basis underlying the complex morphology of vertebrate neurons. We focus on proteins that are specifically expressed in neurons and might contribute to specialized molecular pathway that serve neuron-specific roles for supporting growth of long axons and dendrites, as well as regulation of protein homeostasis in young and aging neurons. Our current focus is on two broad areas, the first investigates endosomal neuronal function, the second cytoskeletal regulation of neuronal morphogenesis. The endolysosomal system plays a central role in regulating “cellular trash removal.” In addition, the quantity and quality of signaling cascades downstream of many (if not all) membrane receptors (such as NGF signaling) are regulated by endocytosis and endosomal trafficking. This work will elucidate fundamental cell biological mechanisms of how neurons regulate membrane traffic during development to grow axons and dendrites. 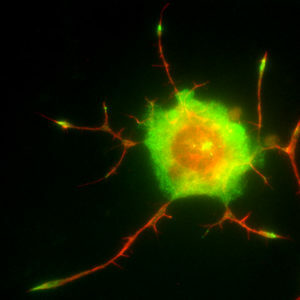 Given how many diseases of the nervous system (such as Alzheimer’s disease, Huntington’s disease) as well as degenerative and regenerative processes after injury can be traced at the cellular level to disruptions of endolysosomal pathways, the fundamental insights gained from this work also have far-reaching translational implications. 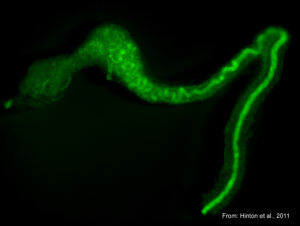 Secondly, we are studying the multifunctional protein doublecortin (DCX) which is expressed in newborn neurons. The importance of DCX in brain development is underscored by the many human DCX mutations, which lead to a neurodevelopmental disorder, Lissencephaly, and to epilepsy. To date, most work has focused on the role of DCX in regulating microtubules, and thus on the question of how DCX mediates migration, axon and dendrite growth via microtubule regulation. However, several other binding partners of DCX have been identified suggesting additional roles for DCX in regulating cellular adhesion and membrane trafficking. Our central question is: do these additional binding interactions mediate additional subcellular functions of DCX in addition to microtubule regulation, and if so, how are these important for regulating diverse aspects of neural development, such as neuron migration, axon outgrowth, and dendrite arborization? The Yu laboratory is interested in molecular and cellular mechanisms governing mammalian kidney development. In particular, our research focuses on two areas: 1) formation of the epithelial and vascular components of the renal medulla compartment and 2) the role of miRNAs in kidney development. In the first research area, we demonstrated a central role of Wnt7b signaling from the non-branching ureteric trunk epithelium (the precursors of the renal collecting ducts), and p57Kip2, a gene implicated in the human Beckwith-Wiedeman syndrome and IMAGe syndrome and expressed in a subset of renal capillary mural cells, in the morphogenesis and development of the medullary collecting ducts, the loops of Henle, and the vasculature. In the second research area, we uncovered a critical role of miRNAs in the control of the precursor vs differentiated cell fate of the ureteric bud epithelium, and self-renewal of nephron progenitors. These findings and the follow-up work should assist (re)generating nephrons and renal collecting ducts.